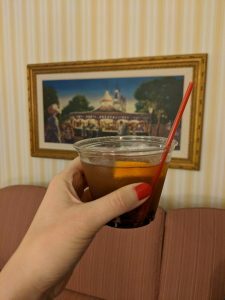 It had been many years since our last Boardwalk Inn and Villas experience, but after staying at Disney’s Beach Club Resort I wanted to spend more time in the Epcot resort area. It seems many people are confused about the difference between Boardwalk Inn and Villas. I’m here to help explain the resort and review our room. Read more about our other Disney World room reviews here. Boardwalk Inn and Villas is an Epcot area resort. Disney’s Boardwalk Resort consists of 3 areas: Disney’s Boardwalk Inn, Disney’s Boardwalk Villas, and the Boardwalk area itself. The big difference between Boardwalk Inn and Villas is the type of room you can expect. Boardwalk Inn has traditional hotel rooms whereas Boardwalk Villas has studio, 1-bedroom, and 2-bedroom villas. The third part of the resort is the Boardwalk area which has tons of places to eat, drink, and enjoy “street” performances. The Boardwalk Inn and Villas decor is reminiscent of Atlantic City around the early 1900s, and the Boardwalk itself references Coney Island of the same time period. 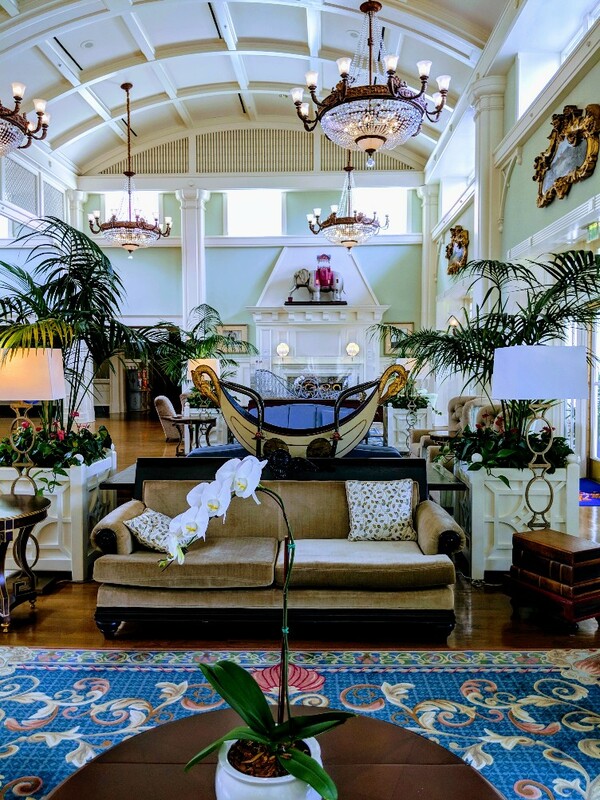 The lobby (shared by Boardwalk Inn and Villas) is decorated in traditional furnishings, muted blues and greens, gilded picture frames, and crystal chandeliers. 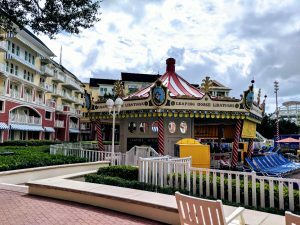 There are also whimsical nods to boardwalks found throughout the resort such as a model wooden roller coaster and antique carousel found in the lobby. Is there a difference between Boardwalk Inn and Villas pool access? No, there is not. Boardwalk Inn and Villas has 3 pools. The main pool is Luna Park Pool. Luna Park Pool continues the vintage carnival theme and has a 200-foot (60-m) water slide in addition to a kids’ play area. If you are looking for a quieter pool experience there are two additional leisure pools. One leisure pool is to the south of Luna Park Pool near the Boardwalk Villa wing. The other leisure pool is found on the east side of the complex closer to the Boardwalk Inn area. There are several food and beverage options at Disney’s Boardwalk Resort. The food choices range from fine dining to food carts on the Boardwalk. AbracadaBar – Specialty cocktails are served in vintage illusionist decor. Ample Hills Creamery – This ice cream shop has a variety of flavors (including a couple of alcoholic float options). Belle Vue Lounge – Have a breakfast sandwich, muffin, or other pastry for breakfast and enjoy it in your room or use the limited lounge seating. Later in the day grab a cocktail at the Belle Vue Lounge. I took mine to go and had my Old Fashioned after Elizabeth was tucked in for the night. Big River Grille & Brewing Works – This microbrewery serves many varieties of beer made on-site that you can pair with typical bar food. This restaurant serves lunch and dinner daily and even has a kids’ menu. Boardwalk Bakery – Grab breakfast sandwiches or pastries in the morning or soups, sandwiches, and treats for lunch or dinner. BoardWalk Joe’s Marvelous Margaritas – Find a Mickey pretzel and a drink at this small Boardwalk stand. Flying Fish – Flying Fish is a fine dining restaurant serving seafood and prime steaks daily for dinner. We walked by on several occasions and ogled the food inside. ESPN Club – This large bar has tons of TVs tuned into your favorite sporting events. ESPN Club serves lunch, dinner and has bar service. Leaping Horse Libations – Are you having too much fun at the Luna Park Pool to leave for food? Leaping Horse Libations has some quick service meal options served right next to the pool. Pizza Window – Grab some pizza for lunch or dinner at this walk-up pizza window. The To-Go Cart – Hungry for hot dogs, a burger, chicken sandwich or pulled pork? Stop by this stand for a quick meal and find a spot on the Boardwalk to eat. Trattoria al Forno – Meet Rapunzel, Flynn, Ariel, and Eric at a character breakfast or enjoy a traditional Italian dinner. The Boardwalk area always seems to have something going on. We stopped to listen to guitarist/singers on the Boardwalk both nights of our trip. These talented musicians regularly take requests from the crowd. I also saw a street magician performing tricks, but we didn’t have time to stop. 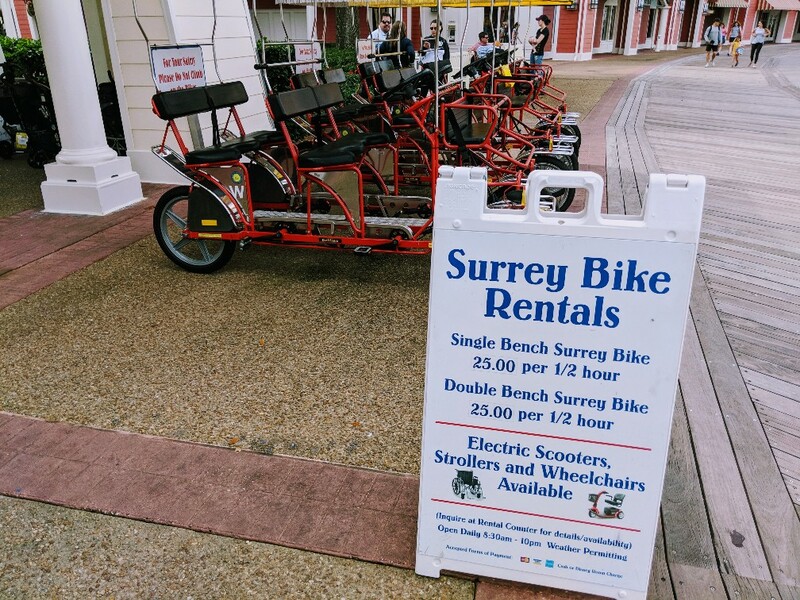 Rent a single or double bench Surrey bike at Surrey Bike Rentals on the Boardwalk. We saw lots of people riding around the Boardwalk, Beach, and Yacht Club areas on these unusual family bikes. Our room at Boardwalk Inn was a standard room with a standard view. What exactly does that mean? Standard view means your room will overlook one of the following: Disney’s Boardwalk Inn Gardens, Leisure Pool or Parking Area. Our room looked out over a small roadway below, but we could actually see the Eiffel Tower in France at Epcot, too. Standard rooms can have any of the following sleep configurations: 2 queen beds and 1 day bed or 1 king bed or 2 queen beds or 1 king bed and 1 day bed. Our room had the 2 queen bed and 1 day bed configuration. When Elizabeth saw the room she immediately said “This room would be perfect for you, me, and Grandma!”. And she was right. 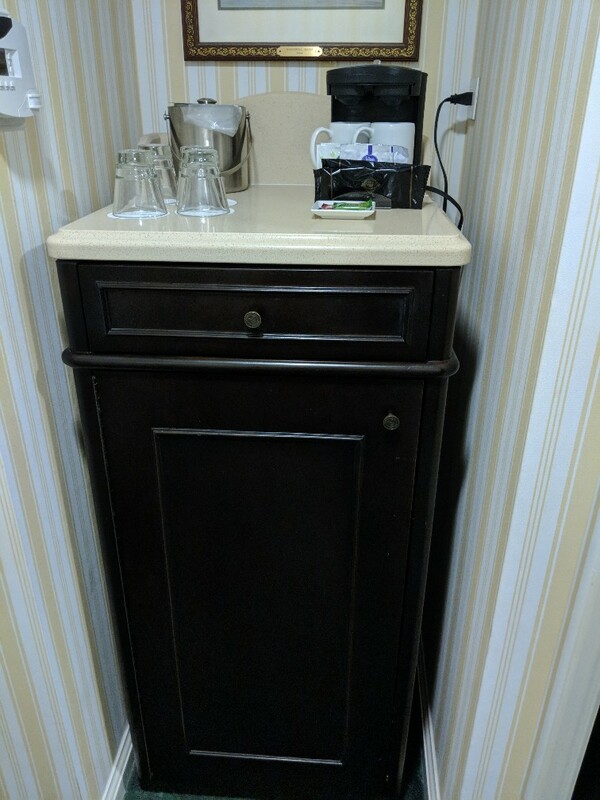 When you enter the room you will find a small hallway where the mini-fridge and coffee supplies are tucked into a small nook. There is also a decent size closet with a small safe inside. One of my favorite features of our Boardwalk Inn room was real blackout curtains! We tend to stay out later and sleep in a little (which is easier in a dark room). There is also a desk with a chair and a TV stand/dresser. Elizabeth discovered a small rolling table tucked under the desk. This rolling table was a great place for us to eat breakfast in our room (and I would never have noticed it without Elizabeth). Just past the desk through the patio door is a balcony with two chairs and a small table. 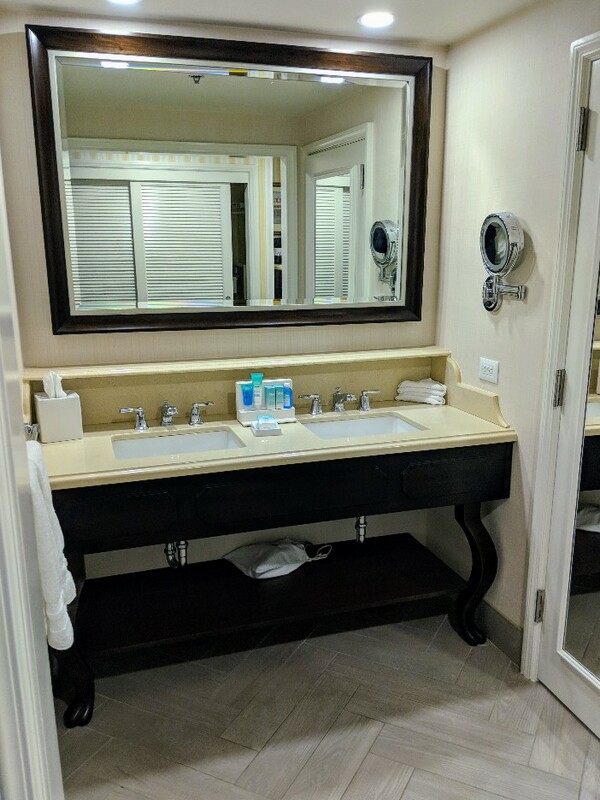 The bathroom at Boardwalk Inn had the sinks separate from the shower/tub and toilet area, but unfortunately the double sinks were open to the room. This meant I had to keep the lights very low in the morning and be extra quiet while getting ready so I didn’t wake Elizabeth. Despite this design, the bathroom was much larger than the one we had at Disney’s Beach Club in a standard room. Free in-room WiFi is available at Boardwalk Inn and Villas. This WiFi will not allow you to stream video via Netflix or similar services, but it does work to check email, the My Disney Experience App, or social media. Boardwalk Inn and Villas charges resort guests a fee of $24 per night to self-park at the resort. 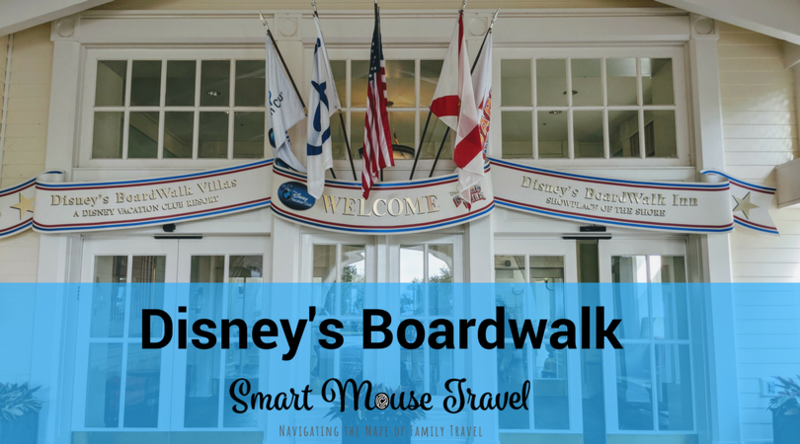 The easiest way to get from Boardwalk Inn and Villas to Epcot is to walk. There is a walkway from the Boardwalk to Epcot’s International Gateway. You can also take a short boat ride from the dock behind Boardwalk Inn and Villas that drops you at the same entrance as the walking path. Most people prefer to take a boat to Hollywood Studios from Boardwalk Inn and Villas. Grab the boat at the dock located behind the Boardwalk lobby. There is also a walking path along the water, but it is about a 15-minute walk from the dock to the Hollywood Studios entrance. 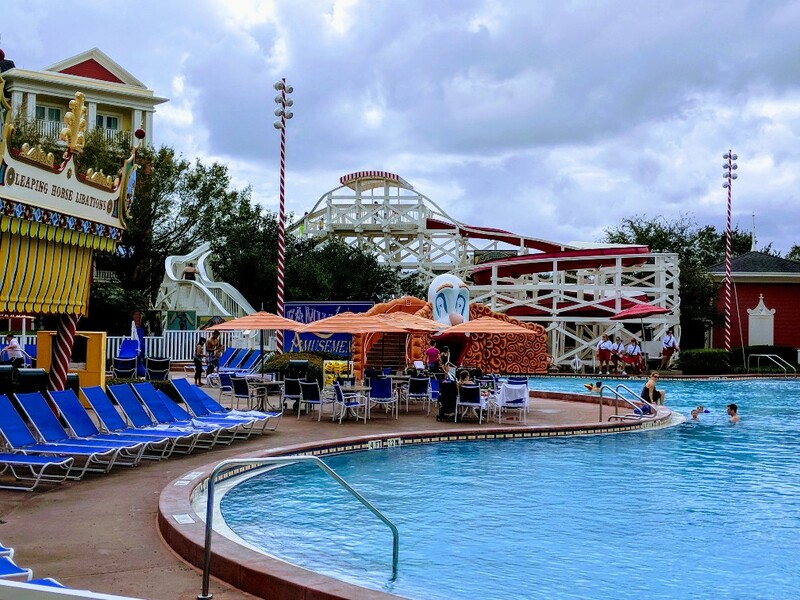 There are two choices to get from Boardwalk Inn and Villas to Magic Kingdom. Bus – There is a bus stop in front of the resort. Here you can board a bus to go to and from Magic Kingdom. Monorail – There is no direct way to get from Boardwalk Inn and Villas to Magic Kingdom with the Monorail. However, you can walk to the Epcot Monorail stop at the front of the park to take the Monorail to the Transportation and Ticketing Center and then transfer to the Magic Kingdom Monorail line. We tend to do this in reverse. We take the bus to Magic Kingdom to enjoy the start of our day at Magic Kingdom. Then we take the Monorail to Epcot in the afternoon to finish our day at Epcot. Then we walk back to the hotel at night. This transportation hack also works if you are staying at Disney’s Beach Club Resort. Go to the front of the resort and find the bus stop. Here you will take a bus to get to Animal Kingdom, either water park, or Disney Springs. Boardwalk Inn and Villas did not disappoint us. 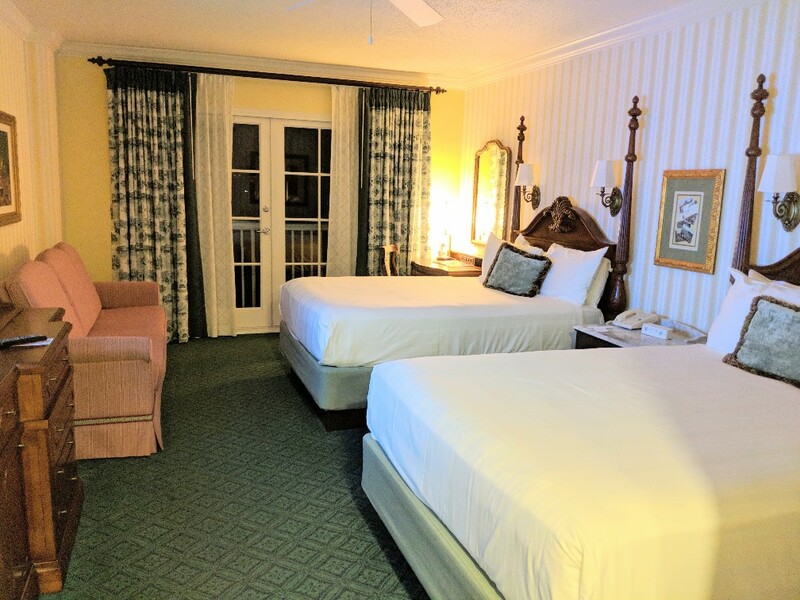 We loved the spacious room, the ease of walking to Epcot, and all the great food and entertainment options to explore on the Boardwalk. 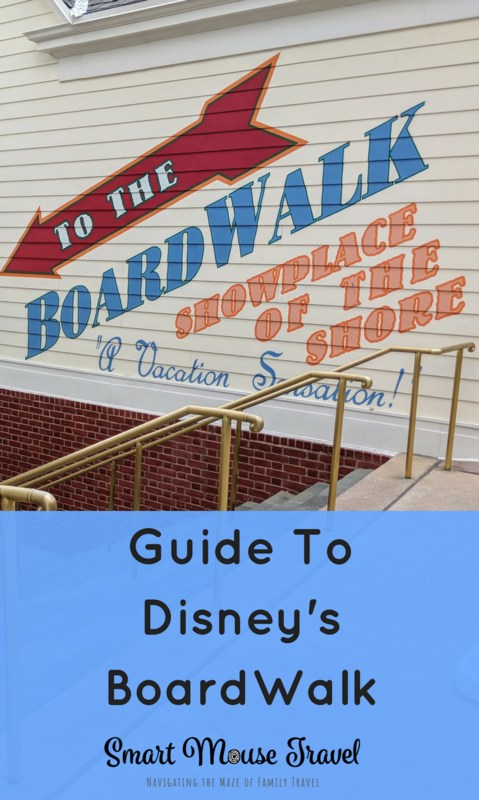 Having Boardwalk so close to Disney’s Beach Club Resort meant we got to do some of our favorite activities there, too. The thing I liked least during our stay at Boardwalk Inn and Villas was that our room was at the very end of a wing of the hotel. This meant the walk from the lobby (or when returning from Epcot or the Boardwalk area) was very long. At least being away from the hustle and bustle meant that our room was very quiet. Some of the rooms at Boardwalk Inn overlook the Boardwalk where the musicians and restaurants are busy until late in the evening. I imagine these rooms might be a bit loud for those looking to get to sleep early at night. Want to see our reviews of other Disney World Resort options? Do you know if the Boardwalk VIllas have basic balconies or verandas/patios? We are staying in a 2-bedroom lock-off villa. We’ve not stayed at one of the 2 bedroom lockoff villas so I did some research to see if I can answer your question. I talked to a Disney vacation planning specialist they told me that there are 3 small patios or balconies in this type of room. There is a balcony off of each bedroom and one off of the living area, but they are not interconnected.